Sunday started as a "clean-up" day for me and turned into a 2-day birdathon that left my head spinning. I started out looking for Monk Parakeets, a "gimmee" for local birding. These birds are sometimes called Quaker Parakeets and are sold in pet stores, and these Monks were escapes from that trade. They found a way to survive the New York winters, and now have an established wild population in Brooklyn. 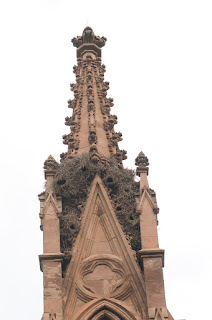 They've built their nests in a few spots around the borough, but the largest and easiest to see is the nests on top of the main entrance to the Greenwood Cemetary. When I asked the lady working at the cemetary entrance where the Parakeets were, she just smiled wearily and pointed up...that poor woman. Unlike the Pine Grosbeaks, which are parrot-like but fairly silent, these are actual parakeets, and they make a racket. On the spires of the entryway there are several large communal nests, and the birds are both in the nests and feeding nearby. I followed my ears to one noisy flock feeding in a nearby tree and snapped a few shots before moving on to Point Lookout. I've been looking on and off a Red-Necked Grebe for the past week or two, and Point Lookout is a good place to find them. This is the kind of bird that's not really a rarity, but just uncommon, and not something you want to have to chase. Luckily I ran into Seth Ausubel, and he pointed out a bird in the channel...sure enough, a Red-Necked Grebe. This was the second bird Seth had pointed me to this year, the other being the rare Barrow's Goldeneye on the North Shore of Long Island in Oyster Bay. I headed there next--although I'd seen the bird, it was too distant to photograph, and I wanted to get a photo for my 2008 Gallery. On the way I stopped in Massapequa and got photos of another bird I'd seen but not shot, the Long Billed Dowitcher. Also spotted a Greater Yellowlegs in the same pond, and apparently there was a Common Teal there, too, but I missed it. The Goldeneyes were much closer this time, off the point of Center Island, and I was able to get a few decent shots of the Barrows. It was about 4:30 now and the light was fading, so I started back to Brooklyn. On my way I checked my email and got a start when I saw a Pacific Loon and Eared Grebe were both seen on Cayuga Lake, above Ithaca. These are both rare birds and worth a chase, so it looked like my day wasn't over after all. I grabbed a few things at home and headed upstate. Now it was about 9pm and I was nearing Ithaca, and I checked my email again. Ross's Gull in Niagara! This is one of the rarest occurences on the East Coast, and a very exciting bird to have nearby. So I just kept driving, and got into Niagara around 1am. At 6:30 the next morning I was at Goat Island with Jim Pawlicki, a great local birder who was also excited to look for this beautiful little gull. We worked the area above the falls for about 2 hours, scanning through the thousands of gulls that regularly congregate here in the winter. We were walking back towards the parking lot when Jim spotted a small gull flying nearby and alone...it was the Ross's! I immediately started shooting, and got a few flyby shots before we chased the bird upstream. We watched it fly with some Bonapartes gulls for a few minutes, and then lost it again. Jim called all the locals, and within 20 minutes there were about a dozen of us trying to refind the bird. Just as I was about to leave, someone spotted it sitting on the ice, and we all got really nice looks at it through our scopes. It's so satisfying to find a bird and then really get to study it, as opposed to some quick flyover. And it was really very lucky to have seen this one...there were lot of ways that I could have missed it. I didn't have my passport with me, and I had Monkey in the car, so if it had turned up somewhere on the Canadian side that I couldn't see, them I would have missed it. Also, if it had been on the Canadian side and visible, I would have gotten to see it, but not to count it as a New York bird! So all in all a very successful chase. I headed back to Ithaca and never did see the Pacific Loon or Eared Grebe, but went home satisfied nonetheless. If there's one thing that I've heard about Big Years, it's that you have to chase rarities. That means that if someone sees a rare bird anywhere in the state, you have to drop everything and go try to see it. That's exactly what happened on Tuesday around lunchtime, when I checked my emails. 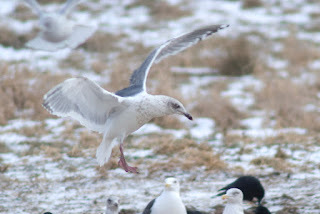 Several posts had come up on the birding list servers that a Slaty Backed Gull had turned up in Ithaca, at a composting area near Cornell University. Gulls are often seen scavenging around dumps and composting areas, and this one had traveled from somewhere in Asia to do just that. Slaty Backs are one of the rarest gulls to be seen on the East Coast, so this was a great bird to see. I considered trying to get to Ithaca by dark, but it was already noon and it's about a 4 1/2 hour drive, so instead I finished up some business and left that evening. The next morning at 6:30 I was at Stewart Park, on the southern end of Cayuga Lake, one of the Finger Lakes. The gulls in the area like to sleep here, and then move out to the compost area to feed during the day. I spent a little time maneuvering to see the gulls, but then found the Slaty Back almost immediately. It has a darker back than the common Herring or Ring Billed Gulls, but not as dark as the Greater Black Backed gulls that were also present. Gulls can be especially hard to ID, and rare gulls don't always stand out in a crowd, but this one certainly did. I watched it lounge around on the ice for about and hour, and then watched it fly off. I went over to the compost area and there it was, squabbling with the other gulls for bits of food, and then resting on a nearby hillside. It was a lot of driving, but a very straight forward chase, and a terrific addition to my list! I got back Wednesday night, and before going to bed I checked the lists again. 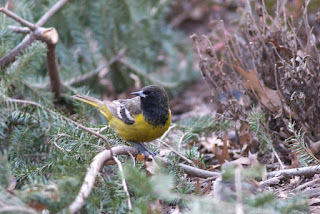 This time the postings were even more remarkable: Scott's Oriole in Union Square Park! This is a first bird for NY State...normally it resides in the Southwest and Mexico. My heart was racing as I set my alarm for 5:30am... the next morning I picked up Peter Dorosh, top birder from Prospect Park, and we drove in to look for the bird. At around 7 the sky was lightening, and a number of birders from all over the city began to show up. The bird was seen within moments, and we watched as it flitted around the commuters, ate with the pigeons, perched on park benches, and ate a slice of orange we threw to it. It's a beautiful bird, and I encourage anyone with an interest to go and see it...it may be the only time you ever do! I went out to Staten Island this morning to look for the Red-Necked Grebe that had been reported there a few days ago. Apparently, the information was a little too old, and the bird was absent. I'm learning this lesson over and over: bird information is extremely perishable, and the sooner you can get to the bird the better chance you have. 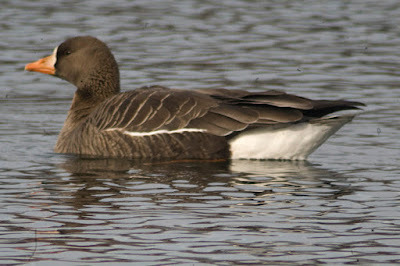 While I was at the reservoir I did re-find the Greater White Fronted Goose that I'd seen on the 4th. What a difference! Whereas last time I was shooting through a chain-link fence at dawn, and getting just passable photos, this time I was able to see the bird from the other side of the lake in good light, and got much better shots. Here's one old and one new. The past two days I've been working my way down to Brooklyn. In Oswego I picked up a Glaucous Gull...you can see the size difference from the Iceland Gull and the stout, pink beak with black tip. I tried Montezuma NWR again for Tundra Swan and Ross's Goose, but again the birds were too far out to get a good look at. Once again relying on other great birders to help me out, I spoke to Matt Young, an experienced birder in the Finger Lakes area. He gave me some good tips on where to look for Crossbills, the last winter finches I need for my list. I spent one afternoon looking, before staying overnight in a local town. No Crossbills, but I saw at least four Rough Legged Hawks, and two big groups of Turkey (80 plus birds each). On my way back for dinner, I looked up and saw hundreds of crows streaming overhead. They were roosting in the nearby trees...seeing all those black birds flying in the near dark seemed otherworldly, and I find it comforting to think that there is this big world outside going on all the time, whether I see it or not. ck roads in the area, but didn't have any luck, depite Matt's excellent help. Crossbills are tricky because they have somewhat nomadic tendencies, and although you can go where they might be (they feed on pine cones), that doesn't mean you'll see them. My last stop of the trip was in New Paltz. I had emailed Christine Guarino, who had reported Red Headed Woodpecker in the area. Red-Heads were much more common as recently as five years ago, but have been in serious decline, and now they take some effort to see. Just as I drove up to New Paltz, wondering exactly where to find the bird, Christine called me and offered to come out and point them out. It's just another example of the amazing generosity that I've seen from birders all over the state. 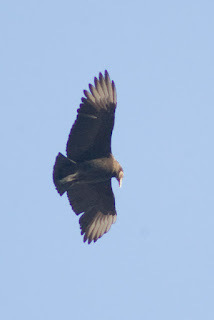 While I was waiting I got some shots of a kettle of Black Vulture that were soaring overhead...Christine says they are local residents. She drove up and showed me where to scan for the woodpecker, and withing a couple of minutes I'd picked out a distant bird with a bright red head and white tail...bingo! Christine confirmed it, although it flew off before I got a photos (ANOTHER bird I need to go back to get a good shot of). We drove down the road and scanned some Canada Geese for anything unusual, and then I headed back down the Thruway to Brooklyn, my first Northern trip of the year a definite success. Thanks to the great Northern birder Joan Collins, I had some excellent information today on where to find the Boreal species that I'd come to the Adirondacks for. I followed her directions, and hiked around Bloomingdale Bog from sunrise until about 11:30, and found just about all the birds I was looking for. 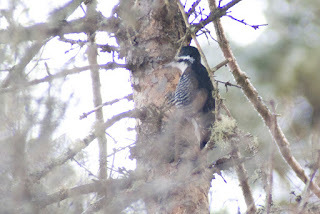 These included Boreal Chickadee, Gray Jay, Ruffed Grouse and Black Backed Woodpecker. The forest here is amazing in winter, like something out of Narnia. It's almost totally silent, especially with the dampening effect of the snow. 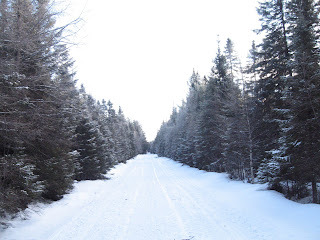 I didn't need my snowshoes since I was on snowmobiling trails, and while I think snowmobiling is ridiculous (seriously, we don't have enough motorized vehicles in the road, that we need to tear around state forest? ), I did appeciate having a packed down trail. The birds here are well hidden, and a lot of looking for them is actually listening. I'd walk a hundred feet, stop, listen, walk another hundred feet. At first you don't think there could be anything living in these sno w bound pines, but suddenly you hear a faint tapping, or a chip note, and following the sounds you find a group of chickadees high up in the boughs, or a single woodpecker working over one of the trunks. The grouse are an exception, of course...twice I flushed one without ever seeing it, and got a quick look before it vanished again in the forest. They were a little too quick to photograph, but Ruffed Grouse are very common in the Adirondacks, and I'm sure I'll get another opportunity in the year. 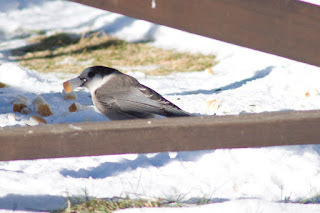 th Gray Jays picking up bread cubes that the owner had set out. One jay spent a good minute picking up one cube at a time, then setting it down and checking another one, until it found the one it wanted and flew off into the trees to eat. Red Breasted Nuthatch and more Black Capped Chickadees were in evidence, as was a single Common Redpoll. window with several feeders just outside, and the birds come right up to the window. There's even a little speaker/microphone arrangement so you can hear the birds twittering without having to open a window! Not bad on a 10 degree day. 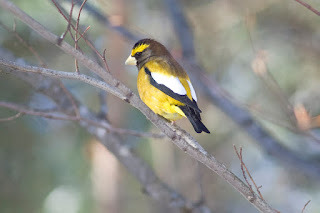 There was a single Evening Grosbeak in with the other birds, and I got a lot of shots...here's one I like. st bird in the state, with a probable population under 100 (and maybe many fewer). These birds were introduced in the thirties by the thousands and established breeding populations for the past 70 years, but recently have been in serious decline and are now in danger of being completely extirpated from the state. The last major population was in Cape Vincent, but after talking to some local birders it seems that that population is gone, with the last sighting being at least 2, and probably 3 or 4, years ago. There was a sighting, though, in Malone about 6 weeks ago, so I thought I'd give it a shot, and get a little more familiar with the area. I drove the farmlands just south of Malone for the rest of the afternoon, scanning the stubble fields and ditches for the birds, but no luck. It won't be the last time I'm up looking, but for now I'm putting off the hunt until I get a little more information and time. I moved my way North today, from Watertown to Cape Vincent, then Potsdam, and down into the Adirondacks in Newcomb. There is a bird called the Grey Partridge which was introduced into New York as a game bird in the 30s. These birds established breeding colonies and have lived as wild birds in the state ever since. Lately, though, their population has declined drastically, and now there are only a handful of birds in the state. 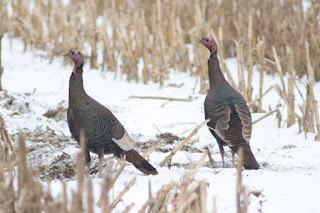 This is a bird that I'd especially love to see for my Big Year, and my Bull's Guide (a record book of birds in NY) told me that Cape Vincent is the last stronghold for Partridge. So this morning found me cruising through the snowy back roads of Cape Vincent, and beautiful penninsula towards the top of New York State, just across the border with Canada. The area is lots of farmland leading down to a craggy coastline, and I can see why it's a popular summer vacation spot. As I was driving up and down these back roads, windows down and heat blasting, I made a couple of calls to people that I thought might know something about the birds. As the morning progressed, I talked to some very helpful birders who told me that the last time the Partridge was seen in Cape Vincent was between two and four years ago, and was now believed to be extirpated. The only spot in the state that the bird has been seen recently, it turns out, is Malone, which is about 3 hours east of Cape Vincent. Well, I really want to see this bird, so I made some calls and juggled some work stuff to extend my trip a couple of days to take a shot at it. I'll be visiting Malone in a day or two and will, of course, keep you posted! Meanwhile, I spotted a beautiful male Ring Necked Pheasant at a feeder, and found a Lapland Longspur in a flock of Horned Larks on the road. cent. Here are two photos, one from a distance and one a little closer. In Potsdam I stopped at Joan Collins house. Joan has feeders and has been posting online about some amazing birds she's had this winter, including hundreds of Bohemian Waxwings and a couple of Hoary Redpolls. There were just Common Redpolls at the feeders today, but Joan was very gracious and friendly, and we talked a bit about finding some of the area specialties, especially in the Adirondacks. I guess today's theme is the importance of information...good info on a bird usually makes the difference between finding it and getting skunked. Joan gave me plenty to work with, and I plan to take advantage tomorrow morning in Bloomingdale Bog. Got up early and went out in search of Bohemian Waxwing. Will and Besty had showed me a spot the evening before where they'd seen them, so I went back to the spot in the morning. After a little searching I found a flock of about 300 Cedar Waxwings in an apple orchard, feeding off of crab apple trees. I wasn't sure of the protocol, but no one seemed to be home so I walked back in the orchard and scoped the flock. There were about 1/2 dozen Bohemians mixed in, and got a bunch of photos (it was snowing, so they're not great photos, but they're photos). Bohemians are beautiful birds, and we don't see them so easily in New York every year. As I mentioned in a previous post, this is an irruptive year for winter finches, so we're seeing birds that might normally spend their winter in Canada. The Bohemian is a beautiful bird...really knocks your eye out with it's bright markings...and I was glad to get it checked off, since these birds are also fairly nomadic, which means you never know where they're going to turn up. et a definitive photo. (You distinguish between these species by the Ross' is smaller size and it's beak / head shape, so a close look is important). Here's a photo of a Snow Goose -- Snow Geese are usually white, but this is a dark morph variation. Different types of birding create different challenges...yesterday it was trying to make out the fine details on a fast flying bird from a distance. Here it was looking at a group of 10,000 birds and picking out the one that was different, kind of like a giant game of Where's Waldo. Another birder did pick out a Greater White Fronted Goose out of the thousands of Canada Geese, which made the second GWFG I'd seen in the past two weeks. I started my big trip up to Northern New York with Niagara Falls, in search of the Thayers Gull. By its markings it falls somewhere between an Iceland and Herring Gull, and since there is a great deal of variation in each of those species, there is basically overlap in most if not all characteristics that would identify the Thayers. Thayers wasn't distiguished as a separate species until about 35 years ago, and recently the work that established it as such has been challenged as potentially invalid. In other words, Thayers may not exist. But for now it's recognized as a separate bird, and so it's a species I'd like to see! I had a photo shoot at noon on Saturday that was supposed to end at one, but in fact ended at 3pm. OK, no problem, except that as I started the eight hour drive upstate I realized I'd forgotten my passport. Since a lot of the birding I was planning to do the next day was in Canada, I had to turn around and go back to Brooklyn for it. I finally hit the road around 4:30...I dropped my dog Monkey off with my mother in Westchester, and drove north, and drove, and drove. Got into Rochester around 11:30 and slept a few hours, and got up at 5 to meet Willie D'Anna and Betsy Potter at Niagara Falls at 7:30. Will is one of real gull experts, and I knew if anyone could help nail down a Thayers it was him. This is one of the most technical and difficult IDs in birding, and it consists of taking into consideration all aspects of the bird including wingtip pattern, bill and head shape, fleshy-part coloration, and eye color, all of which need to line up in order to have a positive ID. I wouldn't dare make a definitive call on a bird like this without a real expert like Will helping me. ollect at the falls and along the river, and more rare gulls show up here than anywhere. We tried a number of locations, many in Canada looking back at the US (remember, the bird I see has to be in New York). We'd find a vantage point, often several hundred feet up above the flying and perched birds, and then start scanning. One of us would find a candidate, and then try to help the others see it, too, out of the hundreds of gliding and milling gulls. This can take several minutes of calling out the location of the target bird in relation to some landmarks along the river. We found at least four birds that might be Thayers, including one excellent candidate, but none of them was perfect. This is the closest we got. Really, it's got everything it should to be Thayers, but the mantle color (the grey on the back and wings) was just a little too light for our taste. Again, in many people's books this would be a Thayers, but I really want as close to an unequivacable bird as possible. Next we moved down river, and Will got a call from a fellow birder tipping us off to some Little Gulls mixed in with a large flock of Bonapartes. Little Gulls are the opposite of Thayers, ID-wise, since the black undersides of the adult bird's wing really stands out, even at a distance, and is completely diagnostic. Here's an example of a Little Gull (we found 3 total) mixed in with Bonapartes. Overall it was a fantastic day, despite not finding my perfect target bird. It's always great to bird with someone who's much more experienced than you, and I think I doubled my gull knowledge in one day (2x0=?) Will and Betsy, like a lot of the birders I met, were just great people, and I'm looking forward to going up again in search of that elusive Thayers! Went out today to look for Virginia Rail and Long Billed Dowitcher at Massapequa Lake. The weather was inclement, with a fair amount of fog and cold rain. I found the Dowitcher right away, but unfortunately I did it by flushing them, so I only got flying views of the birds. They did call, though, and the call is one of the best ways to distinguish Long and Short billed Dowitcher, so it was a good ID (along with the fact that these birds have been regulars at the lake). I'm sure I'll get some photos at some point in the year. The Rail was a lot more difficult, and for the second time I played Rail calls and didn't see the bird. Not sure what I'm doing wrong (if anything), but I plan to try it again until I see it. I did see a few new birds for the year, including this Winter Wren. I spotted it in the brush and tried to get a photo, but it was being skulky (as they often are), so I played part of a call to see if he would come up. I immediately regretted it when the bird not only came up, but began to hop around me from perch to perch, scolding and agitated. I beat a retreat and felt poorly about interrupting the birds routine, and thoroughly chastised for it. Next I went out to Point Lookout for the Red Necked Grebe that was seen the day before. The fog was limiting, and visibility was only about 100 feet, so the bird may very well have been there and just out of sight. I did find a group of Purple Sandpiper working in the same spot I'd seen Ruddy Turnstone the day before, though. I find that regardless of the conditions, if you go out and work and area something always seems to turn up! I spent the day out at Jones again, looking for Saw Whet Owl, Red Necked Grebe, and anything else. I did the full walk out to the point from the Coast Guard station, which takes about and hour and a half. There were large rafts of Scoter off the point, numbering in the several thousand. There was also a nice sized flock of Long Tailed Duck. I also looked around for owl for a good 45 minutes, and was ready to give up when I ran into another birder. We talked for a bit and I mentioned I was looking for owl. He said, "I can show you", and pointed to a tree about 20 feet away, where the owl was perched at the top in plain view. called their cell phone and they raced back, and we all got these great looks at the bird that other birders had been reporting. The Solitaire perched up on top of one tree, and then flew down and ate a berry, and then flew to another tree--I took a few hundred photos. Here's one of them...accounting for the five days I put in, this is about a 17 hour exposure. I went out to Montauk again to look for the Pink Footed and Barnacle Geese that I had missed on the 3rd. It was an amazing contrast to the freezing cold weather I had that day...balmy and sunny, probably up around 60F. The geese were right where they should be at Deep Hollow Ranch, and I got a good look at both before moving on to Montauk Point, and then back towards Dune Road in Westhampton. Dune road runs along a barrier island, and has marsh and beach on either side. It's a great place to see Bittern, Rail and other marsh birds. I ran into Carl Starace, a birder who lives out on Long Island, and we looked together for the Snowy Owl that's been reported there. Sure enough, we found it perched on top of one of the duck blinds on an island in Shinnecock Bay. Any owl that sits out in the day is ok by me, and this is an especially beautiful bird. This particular Snowy was not fully adult, and had some dark markings in it's plumage. Notably, there was a dark ring around its head that looked like a halo. It was an angel for me: my 100th bird of the year! I left Carl and drove very slowly down Dune Road with the windows open, hoping to flush an American Bittern. These birds are masters of camoflauge, and when then stand still in a marsh they are almost indistinguishable from their surroundings. I spotted this one before I came up on it, and then got out and got some shots before it flew off. Finally, I took another stab at the Townsends Solitaire in Oak Beach. This was the fourth time I've been looking for this birds since January 1st. I arrived around three and met with some other birders also looking for the Solitaire. The bird has been hanging out at the end of a dead end road, and there were a lot of Sunday drivers out because of the unseasonable weather. At around 3:30 a driver came up and made a U turn right where we were standing, and the Solitaire flushed out from some dense brush behind us and flew off to the top of a pine tree. I quickly tried to locate it in my scope before it flew again, but wasn't fast enough and the bird flew west to a distant spot behind the pines. I thought for sure that we wouldn't get another look, and was mentally resigning myself to coming back a fifth time to wait the bird out. Luckily, fellow birder Jeannie Carillo was there and convinced me to stay until dark. At sunset, the bird reappeared! It flew back into a nearby tree, and Jeannie immediately ID-ed it. Before I could get my glasses up it was gone again into the brush between two houses. I was beginning to think I was jinxed with this bird! We both moved around and tried to get a view of where it might be, and after ten tense minutes Jeannie re-found it perched on a dead limb. I got one good look and a positive ID (but no photo) before it flew off again. What a relief! I'd like to have a photo, but the bird is unmistakable and seeing it was enough for me to count it as a "checkmark". Thanks Jeannie! Since the Franklins and Sabines gull dissapeared from Dunkirk Harbour upstate, I've saved a trip there and have been able to focus locally. Yesterday was Long Island, and today I went up to the lower Catskills for some of the winter finches that have been reported there. Many of these birds are eruptive, meaning you won't see any in the area one year, and then the next they'll be everywhere. This has been an "everywhere" year, with birds like Pine Siskin, Hoary Redpoll, Red Crossbill and Bohemian Waxwing all coming downstate, and even as far as New Jersey. This is generally attributed to a crop failure in Canada (the crop refers to what the birds would normally eat), which forces the birds to move south and find food elsewhere. 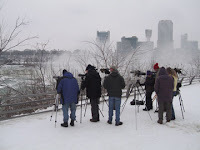 As is so often the case, what's bad for the birds is good for the birders, and many people in our area are seeing there birds for the first time. verts (as opposed to streaked), as well as a "punched in" look to the beak. The bird also has a frosty, grayish white tone (as opposed to a warmer brown), and less streaking on it's flanks. This bird seems to fit all those criteria! seen at a crab apple orchard for the past week. Crabapple trees are a source of food for many birds in the winter, and are a good place to check for unusual winter birds like the Pine Grosbeak and Bohemian Waxwing. I saw about 20 birds in this flock...they were surprisingly quiet compared to other big flocks, and several came within 10 feet of me to feed on the apples. They remind me of parrots in their mannerisms, and there coloration is equally exquisite, if subtler in tone. Finally I went to Shawangunk NWR to look for Short Eared Owl and Rough Legged Hawk. 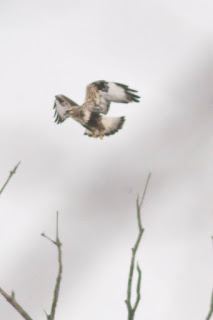 The hawks were in strong evidence, with four separate birds perched around the grassland area (Shawangunk is an old airport that has gone to seed), and there were nine Northern Harriers that I saw, including five adults. The adult Harrier is sometimes called the Gray Ghost because of it's beautiful gray and white plumage. I've only seen a couple in all of last year, but here were five circling and cruising the meadow for prey. The only thing missing was a Short Eared Owl. I saw eight here about a month ago, but none today. Still, I can't complain...it was a great day in the Catskills! I had a wedding to shoot yesterday, so I squeezed in an hour of birding at Prospect Park at sunrise. There's a Yellow Breasted Chat which has been hanging around for several weeks. Remarkably, it's one of two chats that are probably in the park, one near the Boathouse and another in the Botanical Gardens. Chats are notorious for their skulkiness and secretive behavior, so it was a great relief to spot it almost immediately as I came into the park. I got some excellent views (Chat-wise), and a number of photos. 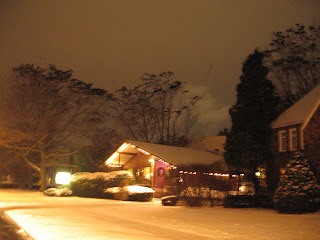 Then back to my house by 8:30 to go to Bethlehem, PA, to shoot a cool wedding at the art center there. While we were doing portraits outside a large flock of crows began to fly overhead. An hour later, the flock was still streaming over...thousands of birds silently moving across the sky. We got back to Brooklyn and in bed by 1am, and then up at 6am to go again for the Townsends Solitaire that's eluded me twice. I spent four hours at Oak Beach from sunrise t o around 11:30, and got skunked again. The bird was seen yesterday, so I know it's still around (I was worried I might be killed or driven out by the frigid weather on Thursday), but it's been very uncooperative, and it's taking up a lot of the hours I'd like to spend looking for other birds. This is the rarest bird in NY right now--I believe this is only the 8th Solitaire to be seen in NY State--and it probably won't show up again this year, so I have to keep trying. At 11:30 I decided to go for a few other birds on the North Shore of Long Island that would also be great additions. I met up with Seth Austubel who is a much more experienced birder than I, and he helped me spot the Barrow's Goldeneye that was drifiting in a flock of Common Goldeneye off Oyster Bay (by Centre Island). The birds were so far away that they were almost invisible to the naked eye, but through the scope I could clearly make out the different head shape, the different sized and shaped white spot on the face, and most importantly the black streak that goes from the shoulder to the waterline that differentiates Barrow's from Common. 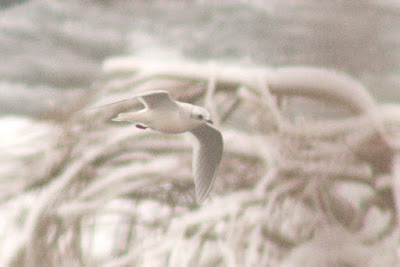 It was too far for a photo, but I hope to return in the next few weeks and get a shot if the bird comes closer to shore. This duck has been returning to this area for a number of years, and should hang out for a bit. Seth also tipped me off to a King Eider nearby, and I drove down the road to look for it. The King can be a tough bird to find, and the females can be hard to differentiate from Common Eider without a great view. I couldn't find the birds at first but then located them a few hundred yards down the beach from where Seth had seen them. Luckily, this King Eider is an immature male, so he's pretty distinctive from the Common Eider he was with. Next I went to Sunken Meadow State Park. It was 2pm and daylight was getting short, but this turned out to be a very easy bird to spot. The Black Headed Gull that has been seen here for several days was happily da rting around a pond at the end of Parking Lot 3, picking up little bits of food out of the water. Gulls can be very hard to ID, but this one was very clear...it looks like a Bonapartes Gull, but with a bright red bill and legs. A few minutes for photos (and for my dog Monkey to stretch his legs), and we were back on the Sagiponack Parkway towards the South Shore to get the last hour of daylight looking for the Solitaire again. I met some birders from the North Fork of Long Island, who told me someone had seen the bird at 12:30, an hour after I gave up. And again, no bird, so now I've logged about 13 hours over 3 days on this bird. Aaaarrrggg! As the sun set I drove down the beach to a spot where a Barn Owl had been called out a week ago. I tried playing a call for a few minutes, but no response. It's the exciting thing about birding...even though it didn't work this time, some day I'll do that and there will be a loud scream back (Barn Owls make a call like someone is getting murdered), or I might even have a big, all white raptor silently swoop down and flash in front of me. I had to do a photo shoot today, but before I did I went out to Staten Island to see the reported Greater White Fronted Goose. I found him on the resevoir off of Victory Road, along with several hundred Canada Geese. He was a little tricky to spot, since he had his head tucked, as you can see in this photo with a Canada. Two differences are its slightly smaller size and a white horizontal line along its side just above the water line. During the next hour he did bring up his head, and I also got a look at his tail. The tail has a white band which is important in separating this goose from the barnyard or Greylag goose, which is a common domestic goose. This is apparently a know Greater White Fronted that has returned over several winters, so that helps confirm the ID as well. I can say this is the first "rare" bird I've seen, with hopefully a lot more to come! I can't believe it's only day 3! I've been going non-stop to pick up the rarities in the area, but I'm afraid my luck has turned a bit. I went out first thing on the 1st for the Townsend's Solitaire at Oak Beach, and spent an hour in the freezing rain with no result. I did spot an Iceland Gull, which may actually be an Iceland/Thayers hybrid. These gulls can be tricky to separate, and it takes a lot of care (and good photos) to ID one for sure (and they're not all ID-able). The next day I came out and stood in the snow and cold for 7 hours (!) waiting for the Townsend's Solitaire to pop up, again without result. So I headed up to Montauk and where some friends had very generously offered me a place to stay. 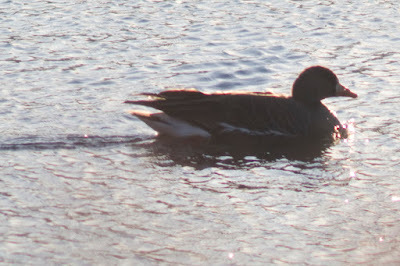 Got there around 9pm and got up at 6, ready to pick up the Barnacle Goose and the Pink Footed Goose, both of which I'd already seen at Deep Hollow Ranch (in Montauk), and which have been hanging out for many weeks. Well, it looks like the sub-zero temperatures drove even the geese away, and I missed both of them as well. I spent a few frigid hours on the cliffs of Montauk Point looking at the thousands of scoter which were sheltering there, trying to find a King Eider. Again, no dice, though I did get Common Eider, and there was a Harlequin Duck bobbing around the rocks. I also got a quick look at a group of 10 or 20 Common Redpoll who seemed eager to keep moving in the cold weather and high winds. Next I tried Hook Pond, which can be a good spot for Tundra Swans...this time the pond was completely frozen over, so no Tundras. I did wind up seeing two Lesser Black Backed Gulls, one at Lazy Point ("Larry", a regular there) and another on Dune Road in a parking lot where someone was feeding the gulls. As the sun went down on Dune Road the gulls flew up and flashed yellow on the blue sky...a really nice way to end the day. Wow! That was a long day. Up at 5:45am, out to Jones Beach to try and get the Townsend's Solitaire that's been lingering there. Well, I got dirstracted at the Coast Guard Station and thought I might get a gull or two, and then wound up hunting for a long-eared owl, and didn't get to Oak Beach (where the Solitaire is) until 10am. Spent some time in the freezing rain looking with no luck, and found out later it had been seen there around 8am. This means I go out again tomorrow and try it earlier, like I had planned for today! Rushed over to Massapequa Lake for Eurasion Wigeon , Lesser Scaup, Canvasback, Redhead, Common Merganser, and other assorted waterfowl, and then back to Park Slope to do my food co-op shift at 1pm. Helped people with groceries until 3:45, and then flew over to Prospect Park to get the pintail that's been there for weeks. No time for a Chat (there are two in the park right now), and no sign of the Goshawk. Wound up with 41 species for the day, including a possible Iceland Gull at Jones Beach (I'm just making sure from the photos). Then home to process 1200 photos (not all from today, but still...) and get everything posted. This is a full time job! I'm figuring it will slow down once I finish this early, frantic rarity collecting, and once I get my list for the year a little more full. I'm posting photos of every species I see this year here, so check them out. Tomorrow it's out to Montauk and the next day possibly upstate for a reported Hoary Redpoll. Yikes!